Author: Graziano Savà. Series edited by: Hans-Jürgen Sasse †. 18 pp. Roman, 274 pp. The Ts’amakko language is part of the Dullay dialect cluster of Lowland East Cushitic. It is spoken by less then 10.000 people in Southwest Ethiopia, 150 km from the Kenyan border. The research has been conducted in Luqa in the north western part of the Ts’amakko territory. It is one of sixteen villages where the cattle-keeping people live. This study presents the first full grammatical description of this language. Before the linguistic analyses the reader gets more information about the language, the people and the research. Adjacent the author presents the phonological characteristics with interesting series of implosives and ejectives, and examines the two-tone system with its restricted functional load. The morphology of nouns and their subclasses are discussed in the next chapter, followed by syntactic analyses of nominal and verbal sentences of this language. After a description of the pronoun system the reader finds a detailled examination of the verb classes, the formal sets of inflection, and the derivation suffixes and stems. Finally, other parts of speech like adverbials and interrogatives, and their morphological behaviour are analysed. The book also contains three sample folktales in transcription, gloss-annotation, and translation. The actors in this stories are animals, the main character is a squirrel, which appears as the smartest of all animals in the Ts’amakko oral literature. The work is completed by basic wordlists in both orders, Ts’amakko–English and English–Ts’amakko. 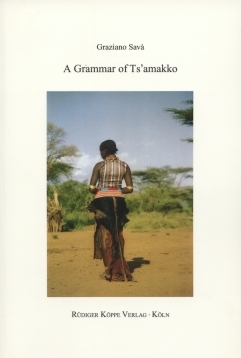 Summing up, the book of Graziano Savà represents the first description of the language of Ts’amakko, one of the most archaic East Cushitic languages. [...] The present data give us an important impuls to a new evaluation of the rconstruction of the East Cushitic comparative phonology (so already Arvanites, Ehret), morphology and lexicon.